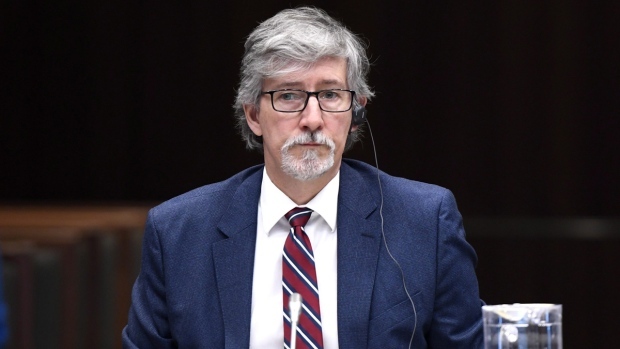 So every year the Privacy Commissioner, that guy in the pic above at this point in time (Daniel Therrien), must give a report to Parliament about privacy. You know it happens every year because I wrote about it, uh [/checks archives], two years ago. Hmmm, you would have thought I would have written about it last year while I was teaching privacy law at McGill, but maybe I was grading exams or something? So yeah, it’s that time of year! Woohoo! Time to get drunk and read a 100-page report. The report is technically called “2017-18 Annual Report to Parliament on the Personal Information Protection and Electronic Documents Act and the Privacy Act” which is boring, so they give it a fun subtitle. For this year, it’s “TRUST BUT VERIFY: Rebuilding trust in the digital economy through independent, effective oversight”, which is catchier, I guess. Caps lock and bold in original, seriously! The report is divided into several sections. Let’s take ’em one by one in the order in which they appear, because any other order would be stupid and confusing. Hello Mr. Therrien! This is the opportunity for the Privacy Commissioner to get a few things of his chest. And he seems pissed! I mean, he’s got a section entitled “Progress from government slow to non-existent.” His news release about the report is entitled “Privacy Commissioner denounces slow progress on fixing outdated privacy laws”. Get to work, government! Canadians need stronger privacy laws that will protect them when organizations fail to do so. Respect for those laws must be enforced by a regulator, independent from industry and the government, with sufficient powers to ensure compliance. Given the opaqueness of business models and the complexity of information flows in the age of data analytics, artificial intelligence (AI) and the Internet of Things, that regulator, my Office federally, should be authorized to inspect the practices of organizations even if a violation of law is not immediately suspected. Individuals are unlikely to file a complaint when they are unaware of a practice that may harm them. Catchy! You can see why he used it as the report title. So yeah, the Commish is tired of the government fiddling while Rome burns – “Canadians cannot afford to wait several years until known deficiencies in privacy laws are fixed.” Because he really he has no powers, he goes on to talk about the basic things his office (the OPC) has done, but it’s just a bunch of guidelines that are not binding. Here are those guidelines btw. Don’t worry about them though, they’re just guidelines! To guide! To sum up, recent events underscore the significant risks facing privacy protection in the digital age. Modern laws consistent with evolving international norms are urgently required if we are to provide Canadians with the protection they expect and deserve. This section is essentially a table of numbers, summarizing the OPC’s activities over the reporting period (which I guess I should mention is April 1, 2017 to March 31, 2018). Like how many complaints they had, how many committees they appeared in front of, and how many Twitter followers they have. That last stat is obviously the most important, so I will report that it is 13,976. That seems kind of low for the office responsible for saving our privacy. For comparison’s sake, beloved (?) Canadian comedian Rick Mercer has 1.76 million followers. Who’s laughing now? Well this should be fun! (It is not). The report in this section details those guidelines I mentioned earlier, and the OPC’s online reputation thing I also mentioned, so no need to dive into that again. This is getting easier! The Commish also details the Parliamentary Report about the future of privacy law, which I wrote about in this post, so I’ll refer you to that. These 100 pages are flying by! without the backdrop of powers to order changes or sanction organizations with penalties for non-compliance, organizations can be slow to respond to our investigative inquiries and equally slow to commit to taking corrective action. This section then turns to data breaches, and there were a lot of them! Notable ones were Bell Canada, Nissan Canada Finance, Uber and the Equifax. The good news is that coming November 1st, these companies will be required to notify the OPC and the public in the case of data breaches. The bad news is that the OPC has no budget to deal with the inevitable flood of reports! This section concludes with a bunch of times the OPC got involved with Parliament, making submissions and appearances to tell us our privacy is in peril. Good to know. The Privacy Act is all about what federal government departments and agencies are supposed to do with your personal information. Fortunately, this section is a whole lot sexier than that! Also, we need some changes to the Privacy Act, which was written in 1983 and hasn’t changed much since. They’ll get right on that. Based on government statistics, it is clear that thousands of breaches occur annually. From our review, it is obvious that some material breaches go unreported and, more importantly, others likely go entirely unnoticed in many institutions. This section is very handy for people like me, and my students! They talk about privacy cases they participated in, and other cases they “followed with interest”. Those followed with interest ones are important, but I’ve written about all of them already, so let’s move on. The OPC cooperated with its international and provincial counterparts on occasion. I am not recapping the Appendices. And we’re done! OK one fun fact, because there are lots of stats in there – Correctional Service Canada was the runaway leader in privacy complaints among government institutions. Oh those wacky jailhouse lawyers! Canada’s privacy laws are weaksauce, everyone knows it and has known it forever, and no one in power seems to be in a rush to do anything about it. Tagged: private parts, you can use my personal info I really don't care, your privacy is not yours. 4 Responses to Is there anything more fun than reading an Annual Report? About privacy? The camels nose is way to far in the tent already. Facebook is the intellectual equivalent of sugar water. Non fattening but far more dangerous to the body politic. Social Credit is the next horror to be released from Pandora’s box. Since Canada get little benefit from Facebook, why not legislate it out of Canada. We dont allow semi automatic weapons in Canada, why allow apps that make us automatons. Because The gov got FB to open shop in Ontario, fund a uni/project, give jobs in AI, and visited with ministers w/o reg’ing as lobbyists. Plus their data will find it’s way in the hands of political parties in order to target you w/o and oversight and w/o any fed privacy legislation applying. automatons is the new norm. Ottawa we have a problem. Not the ruling, the fact is that its not covered by the MSM. Inexcusable. Anyone else notice an uptick in stories about how silicon valley parents hire nannies to make sure their toddlers never look at a screen. Also the MAN gets another flesh wound on DRM.